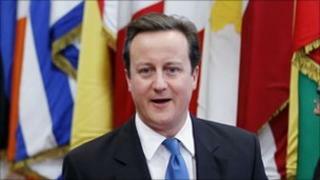 The UK will no longer be "dragged into bailing out the euro" if the government gets its way, David Cameron has said. The prime minister said the government would back a treaty to this effect, which would come into force in 2015. In a statement to the House of Commons on the weekend's EU summit in Brussels, he promised to act in "our interests" in Europe. But Labour Ed Miliband said the treaty would a "minor change" and accused Mr Cameron of "grandstanding". Mr Cameron said the UK had also joined forces with France and Germany to demand a freeze in the EU budget until the end of the decade.